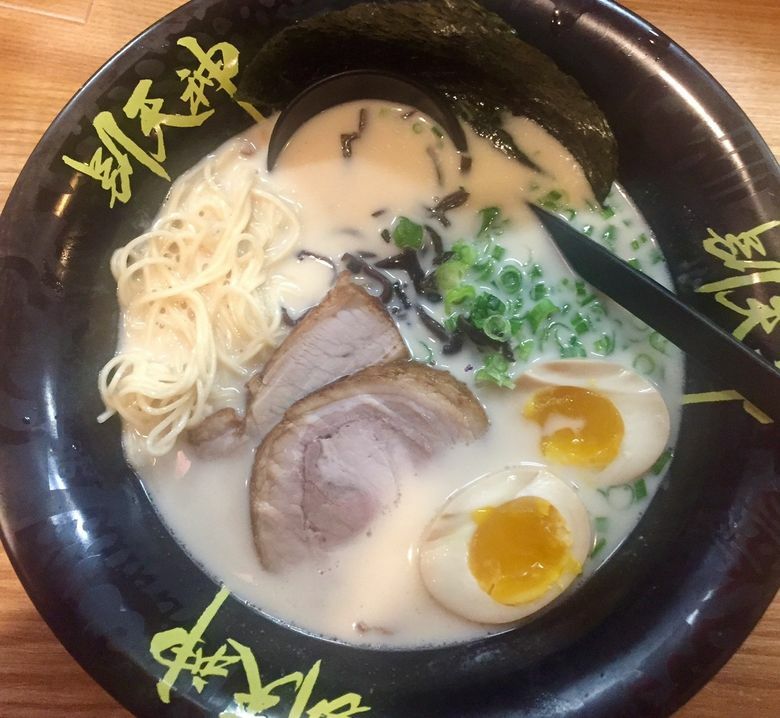 Betsutenjin: A new winner for best ramen on Capitol Hill? The menu is tiny: two kinds of ramen and gyoza. But you don’t need anything more from this new Capitol Hill spot. Most restaurant openings come with great pomp and circumstance these days. And then there’s the hush-hush arrival of Betsutenjin. The Capitol Hill ramen shop doesn’t have a webpage or phone number — it’s been open since July — and insists it’s still in “soft opening” mode. “We’re not ready,” a cook pleaded upon hearing the ramen house might get reviewed. Oh, Betsutenjin is ready all right. People file in every day as soon as the door opens at 5:30 p.m. Betsutenjin, with 22 seats, is already a big hit with the Asian community and as an after-work hangout for line-cooks and bartenders. With a dozen outposts in Hong Kong, Betsutenjin is the latest international ramen chain to expand to Seattle, with plans to open a second branch on the Eastside soon, as well as in Honolulu, Hawaii. The menu: Maybe the shortest on Capitol Hill. Just two ramen options and an appetizer. It’s as fast as fast-casual, designed to get you in and out in 20 minutes. The signature pork-bone ramen ($11.25) is the main draw. The second option, only a limited number of bowls, is prawn miso ramen ($12.95), made with the same signature pork-bone broth as the base. (The kitchen might do a spicy version around midnight.) Gyoza or pork dumplings (six for $4.95) is the lone appetizer. Betsutenjin will add lobster salad in late September. But that’s it. The pork-bone ramen is its thing. The combo special — ramen and a side of four dumplings ($14.25) is its best deal. Don’t miss: The Hakata-style ramen comes with a creamy broth made with pork bones and marrow in a pressure cooker. It’s one of the best ramen bowls on Capitol Hill. Avoid the temptation to muddle the clean, porky flavor with condiments such as garlic, soy sauce, chili or bean sprouts. It tastes fine as is, with al dente noodles, raw scallions, seaweed, mushrooms and two thin slices of fatty pork chashu. Fortify your dinner with a soft-boiled egg if you must. The rich, milky soup has a tinge of sweetness. The noodles will turn mushy if you linger. Eat it the way it’s meant to be eaten; slurp and finish in under 10 minutes. Its prawn miso ramen tastes like the salted sea; it’s fine, but you can get that anywhere. Go for the signature bowl. What to skip: The fillings of the gummy pork dumplings crumbled and disintegrated easily, lacking the desired seared skin and juicy morsels. Prices: The Hakata-style ramen combo with gyoza, and a prawn miso ramen totaled $29.92 after tax, enough for two.